Infuriating and very informative. Makes me understand racism and the anger of African Americans much more now. Will it ever change? I certainly hope so, but with racist people in power, it'll be extremely difficult. I am not sure what this fast-forward overall image of the historically deep rooted racialized dynamics of the US prison system actually succeeds to "reveal" - even for a non-American such as myself this seemed like a familiar story. The documentary did raise a lot of frustrating questions, though, "whys" and "hows"... difficult and contradictory questions that to me seem difficult to answer. A very important and impactful documentary showing how slavery and racism never left America and is still rampant to this day. Pretty good documentary on an extremely important topic. It does not even need to be inventive so much the problem is glaring. I have two criticisms though: there's no comparison with other countries with massive black communities (say UK, France or Canada) and, although the roles of large companies is mentioned, the word 'capitalism' is never once uttered and there is no critique of it. Too bad as I believe that today racism and capitalism are inherently linked, each one furthering the other. I've never been able to get my head around the US' backward race and crime issues. This totally explains it. If it wasn't for the constant drone of wallpaper music distracting me from the information and the repetitive summaries near the end, I would have rated this a little higher. An important documentary outlining the factors leading to America's current incarceration crisis. Manages to be compelling and hold your interest despite the fact most of the documentary is basically people talking over statistics shown in a fancy way on screen. Quer passar duas horas de muita raiva? Assista a esse filme. Queria muito ter cortado o pinto de boa parte dos presidentes dos EUA, com especial ênfase no atual, em que eu cortaria em pedacinhos e o faria comer pedacinho por pedacinho. Filme #1 da Semana da Consciência Negra. Netflix Br. 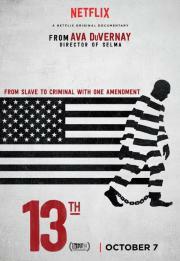 13th is a harrowing and vital film. It provokes thought by playing the images and ideas that so often our society, especially the government, wants to keep undercover. It is a stylish and important trip through the darkness of our history that raises maybe more questions than answers. It's occasionally a bit liberal with the facts, as most documentaries with an agenda can be, but when it shows the unedited deaths of black men and women in the last year, it's tough to argue with. This is a great documentary for the intro to this subject matter. Glad it's been made. The New Jim Crow is required reading after this. Genuinely engaging and frightening in a way that few documentaries of this sort are (by which I mean talking heads -> screen of stats -> voice telling history over old photos -> repeat). If you're me you come from it feeling hopeless and angry, but I'm certain more crafty people will be inspired to make change happen. I saw very similar documentary a few years back already, so it wasn't new or very interesting to me. USA is FUBAR. Alexander's book says all of the same things, but this is probably just as effective. I would've liked more statistics, but if a lack of numbers helps more people see and understand the main arguments here, then that's good. W3E1P2S1V1M1A1R2. Was pretty underwhelmed by the format--strictly interviews with 5 or 6 people who already agree with the premise of the film (and only 2 who disagree, given short shrift); and some historical footage. It also spent too much time rehashing stuff we already know about Jim Crow, etc., leaving too little time to fully contemplate the truly fascinating new revelations about Alec and the war on drugs, etc. But definitely a disturbing (in a good way) film. A fascinating, searing indictment of America and on top of that, a slick, fast-paced film. An urgent film on a very important and heavy subject matter that works decently as a piece of rhetoric and not so well as an in-depth analysis. The statistics and facts often speak for themselves though and I can appreciate it as an engaging call to action with at least some reflective insight. Not a great film but it's kinda not meant to be. Occasionally goes a bit too far in twisting the presented facts, but most of the time it doesn't really need to, as the problem at the heart of it is all too real.